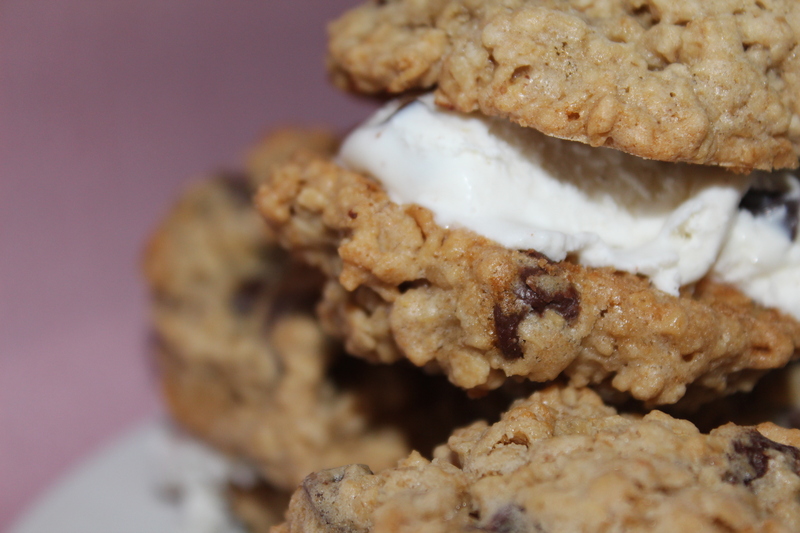 Oatmeal chocolate chip cookies have always been one of my favorite desserts. Growing up, my mom used to make these often and I loved having them in my brown bag lunch at school. It was a small, loving gesture, but none the less, it made me happy (even when I was jealous of my friends who ate their hot-lunch). There’s just something about homemade cookies. 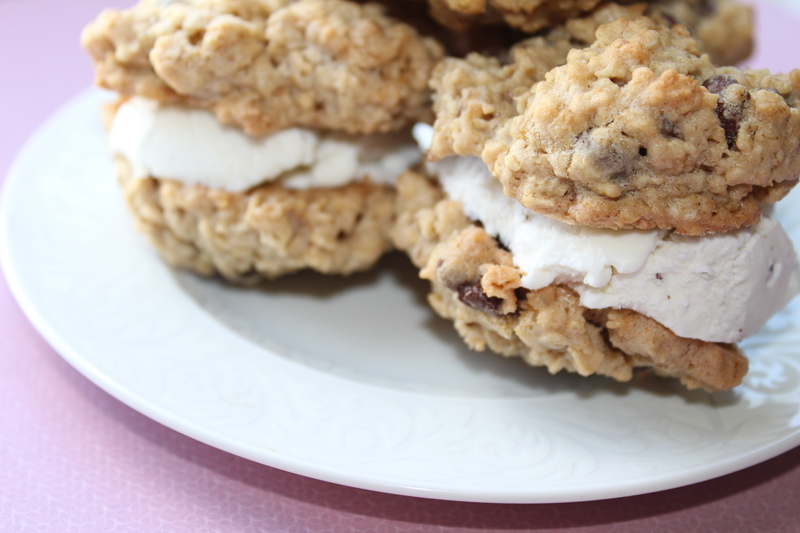 I wanted to make some ice cream sandwiches, and when I thought about the “sandwich” part to this dessert, these cookies came to mind. 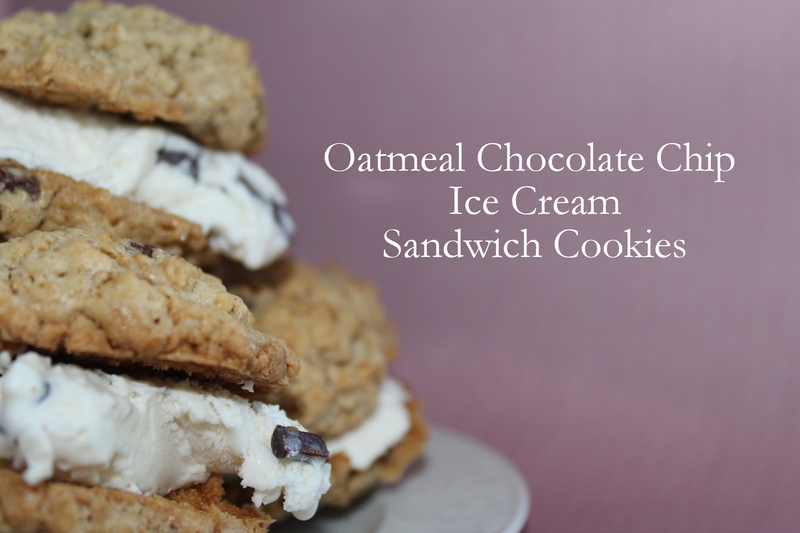 They are by no means a large cookie, but when you sandwich them between ice cream, they make the perfect, summer hand-held snack. I decided to use mint chocolate chip ice cream, because is it my favorite flavor, but you could use whatever type of ice cream you like. (Shoot, you could even replace the chocolate chips with raisins and/or nuts if you like.) 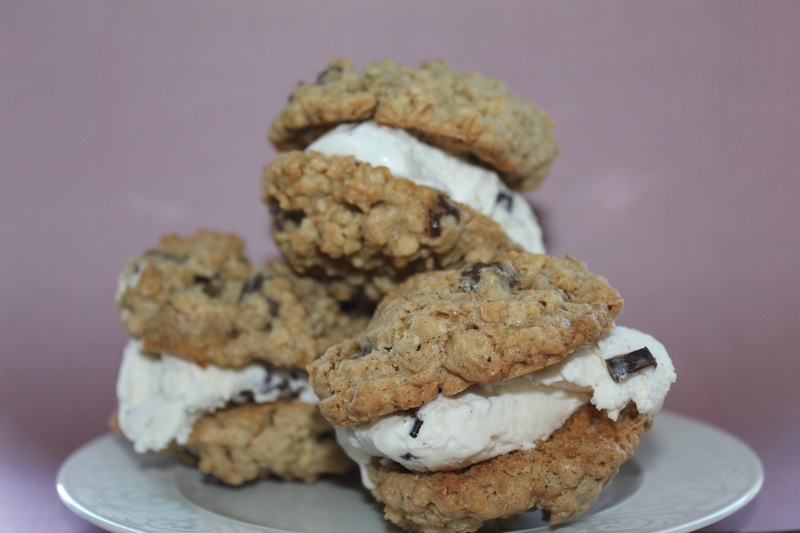 To make these ice cream sandwiches, bake the cookies and let them cool to room temperature. Have the ice cream sit out on the counter for about five minutes, so it softens up a bit (it’s easier to scoop that way). Scoop out some ice cream and press it in the underside of one cookie. Choose a cookie about the same size as the first and press the inside of it against the ice cream. Heat oven to 350 degrees. Beat butter, sugars, egg, water and vanilla in a mixing bowl with a attachment until creamy, about 3-5 minutes. Add the remaining ingredients to the bowl and mix, on slow speed, until all is incorporated. Using a cookie scoop, scoop out the cookies and bake for 12-15 minutes, or until golden brown around the edges.